Each year a single United States Farmer provides food and fiber to 156 people both in the United States and world wide. Provided is some information about the crops and animals that are raised in Ogle County. Corn is an important crop grown in Ogle County. Corn is grown around the world and is one of the world's most widely used food staples. Different corn varieties can be used for food, animal feed or processed to make food and animal feed ingredients, such as high fructose corn syrup, corn starch and lysine. 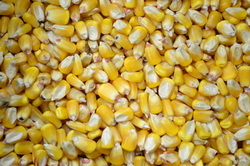 Corn can also be processed for industrial uses, such as ethanol. Corn can be processed through both dry or wet milling. To learn more about corn, visit the Illinois Corn Growers website. Soybeans are a plant that originated in Asia and was brought to the United States in the 1940's and 50's. Soybeans are grown throughout the Midwest. Soy products are rich in protein, iron, calcium and soluble fiber. 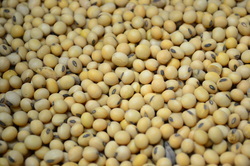 Soybeans are crushed into a soybean meal and used in animal feed and used to make soy flour and proteins. Soybeans are also produced into biodiesel, hydraulic oil, grease, solvent, ink, plastics and other products. To learn more about soybeans, visit the Illinois Soybean Association website. Wheat is a member of the grass family that produces dry, one-seeded fruit, commonly called a kernel. Wheat is grown in 42 states. 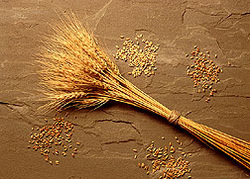 Wheat is the primarily used in grain products in the US. A bushel of wheat contains approximately one million individual kernels. A bushel of wheat makes about 42 pounds of pasta or 210 servings of spaghetti. Half of the wheat grown in the United States is used domestically. To learn more about wheat, visit the Illinois Wheat Association website. Hay can consist of grass, alfalfa, or a combination of the two. Alfalfa is a flowering plant that comes from the pea family. 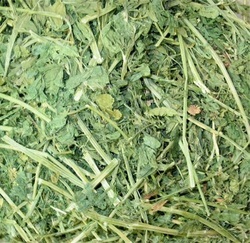 Alfalfa hay is a crop generally used for animal feed. Multiple cuttings per season are usually taken. Hay is usually harvested and stored for feeding use. Hay is consumed by several animals, including cattle, horses, sheep and goats. To learn more about hay, visit the National Hay Association website. 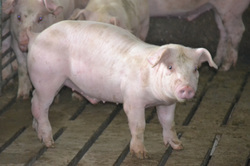 Pigs are raised in Ogle County as a source of meat for food. Pigs eat a mixture of corn, soybean meal and other byproducts. PIgs are mainly raised for meat purposes, but are also used to make glue, gloves and footballs. Pigs are the source of more than forty drugs and pharmaceuticals such as insulin. Pigs are sent to market at the weight of approximately 260 pounds. To learn more about pigs, visit the Illinois Pork Producers website. Beef cattle are raised in Ogle County for meat for food. Beef cattle eat mainly grass and alfalfa hay mixtures along with corn and other additives. Beef cattle are mainly raised for meat purposes, but are also used for food, clothing and leather. One cow hide can produce enough leather for 20 footballs or 8 pairs of cowboy boots. Cattle have four compartments in their stomachs used to digest their food. 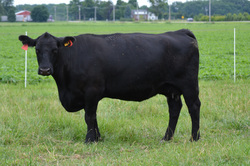 To learn more about beef cattle, visit the Illinois Beef Association website. Dairy cows are raised for their ability to produce milk. Dairy cows provide 90% of the world's milk supply. 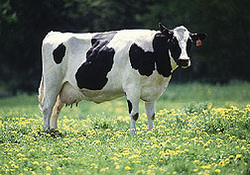 A United States dairy cow gives an average of 2,000 gallons of milk per year. The milk is processed and sold as milk, cheese, butter, and many other dairy products. To learn more about dairy cows, visit the Illinois Milk Producers Association website. Sheep are raised for their wool and meat. Sheep eat grass and hay along with forms of grain supplement to round out their diets. Sheep wool can be used for many things including, sweaters, coats , blankets and boots. 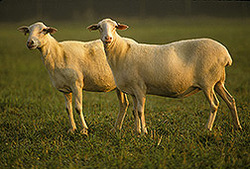 The average sheep produces 15-30 pounds of wool each year. Sheep are ruminants like cattle, having four compartments to their stomachs. To learn more about sheep, visit the Illinois Lamb & Wool Producers Association website.